Abby the Librarian: Joey Fly Private Eye Blog Tour! 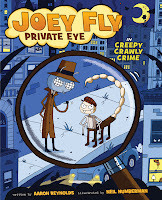 Joey Fly Private Eye in Creepy Crawly Crime by Aaron Reynolds and Neil Numberman. Grades 3-6. Henry Holt, April 2009. Review copy provided by publisher for blog tour. Got a case for Joey Fly, Private Eye? Well, get in line. Fly's working on finding a stolen diamond pencil case for a beautiful butterfly and something's fishy. The clues don't seem to add up... or could it be that his gumshoe assistant is goofing everything up again? Confession: I was not at all sure I was going to like this book. I started it with some trepidation, but I soon realized that, well, Joey Fly is pretty awesome. I didn't expect it to be funny, but it was. Plays on words abound and I found myself chuckling out loud as Joey Fly and his bumbling assistant followed the clues to find Delilah's missing pencil box. Plus, who knew bugs could be so expressive? I am generally not such a fan of things that buzz, but Neil Numberman's art could change my mind. Joey Fly's expressions were often hilarious and he's a fly. That is definitely awesome. I'd hand this to fans of the detective story and, of course, comic book fans. What? I haven't convinced you? Check out the Joey Fly, Private Eye book trailer (that'll do the trick). As an extra, super, bonus feature, I've got Aaron Reynolds and Neil Numberman stopping by the blog today to answer a few questions. AND they'll actually be stopping by today to chat with YOU, so leave any questions you have for them in the comments. Aaron Reynolds is a human, not a bug, but he often writes about bugs. He is the author of Chicks and Salsa, Superhero School, Buffalo Wings, and, of course, the Joey Fly, Private Eye graphic novels. Visit him at his website at www.aaron-reynolds.com. Neil Numberman is a termite currently residing in New York City. Joey Fly, Private Eye is his first graphic novel, but he is also the author/illustrator of the picture book Do NOT Build a Frankenstein. Stop by his website at www.neilnumberman.com. Abby: I really enjoyed JOEY FLY, PRIVATE EYE. It's funny and just perfect for kids who like mysteries or kids who like comic books. How did the idea for this series come about and how did y'all end up working together? Aaron: I love goofy mysteries (probably due to a steady diet of Scooby Doo during my formative years), and I love bugs, so a smash-up of the two seemed natural. One day the title popped into my head, and I went from there. At that time it was called Joey Off, Private Fly, and was just a grain of an idea, but it sprouted as I wrote and took off. As far as working together goes…we never did. Most people are surprised to find that out, but it’s true. Neil and I never even spoke, via phone nor e-mail, until after the book was done. It was my wonderful editor, Reka Simonson, who put Neil with the project. Abby: Can you tell me a little about the process of putting together a graphic novel? Aaron: I start by writing a script, rather than a traditional manuscript. It has what the characters say, “stage directions” about the action, everything you would see in a script for a play. I come from a theatre background, so when I first started writing graphic novels a few years ago with Tiger Moth, Insect Ninja, I was delighted to find out that it was something I was intimately familiar with…a script! It is this final script that I hand over to my publisher, just like any other book. From there, she hands it off to Neil. Neil: Oh, hello there! Well, I’m given the final script, which I then break down into little drawings that are so poor only I can tell what’s going on. These drawings are called thumbnails, probably due to them being the size of a thumbnail! They’re artistic notes that help me decide how to pace the book, where each word balloon should end up, and a rough composition of each panel. From there I begin the sketching stage, which is the part with the most research. I like that I get to simultaneously look up ridiculous looking insects and film noir style compositions. After the sketches are approved, I finally get to do the finishes, where I trace the sketches to get a much cleaner line, and color them in the computer. Aaron: I’ve never told Neil this, but when I first saw the sketches of Joey…I did not like them at all! The guy didn’t have any pupils in his eyeballs!!! How do you have a main character with NO PUPILS IN HIS EYEBALLS! But my editor and Neil assured me that it would not limit his emotional range as a character at all. In fact, at my editor’s request, to soothe any doubts I had, Neil drew 20 versions of Joey Fly in various emotional states. I was sold. Anybody who could make a character so funny and full of possibilities with no pupils and NO MOUTH had my vote. In the end, they were right, of course. Neil’s take on the characters and the world of the book was wonderful, edgy, and exciting. Neil was the perfect choice for the book. It couldn’t have been better, and I was once again reminded that there’s a reason that editors choose the illustrators, not the author. There’s a reason the process works the way it does. I’m so proud of the way the book turned out, and I can’t imagine Joey any other way. Neil: Do you remember the drawing I slipped in there of Joey with pupils? It didn’t look terrible, but he did lose a lot of his mysteriousness and personality. Abby: I have to say that I love that Joey Fly doesn't have pupils. Awesome! You guys have both worked on picture books as well as graphic novels. How is the process different for each format? Aaron: The writing is totally different. A graphic novel really gives you room to move and stretch out…you can develop a story, include stage directions about action, characters, descriptions that aren’t in the writing and that will never be read as part of the story…it really lets you create a VISION for the end product that the illustrator will then take and interpret. Picture books are a blast, but a much more constricting medium. You only have so many words to work with, and the story has to be lean and taut, funny and quirky, but still a story, all in those few words. You also are very limited as to how much you can show or express about the visuals, because the illustrations are totally the illustrator’s turf most of the time. That can be hard, but you learn to open your hands and let go. Even though Neil and I never spoke during the creation of Joey Fly, it felt like we were partners from the beginning, like I had an opportunity to cast a vision to him, to pitch the story to him through my script. You don’t always feel that way with a picture book. So much is up for interpretation. Neil: Picture books, compared to graphic novels, are much less time-consuming. Not including the writing of my latest picture book, Do NOT Build a Frankenstein, it only took me about a month and a half to complete the artwork. In a picture book, the most art you can fit is usually 30-40 paintings, whereas in a graphic novel like Joey Fly, there’s six or seven pieces of art per page, and 90 pages, so around 600 different pieces of art that need composing, sketching, and coloring! It took me almost two years to complete the artwork for Joey Fly! A lot more care must go into each page of a picture book, though, because often times you have to make one painting really speak for an entire chunk of the story. Abby: Have you always wanted to be a writer (Aaron) or illustrator (Neil)? If not, what led you down that path? Aaron: No way. Writer came into the picture much later. I was a theatre major, and then an actor in Chicago. During the day, I did any number of day jobs (waiter, carpenter, administrative assistant, the list goes on). But somewhere along the way in my theatre journey, I started writing scripts and short plays for kids. I fell in love with writing for kids. Even then, I loved kids books, having come to reading them late in my own childhood, and still read many of my favorites. After several years of writing plays for kids, I decided to take a stab at writing books for them. Five years later, after hundreds of rejections, much learning and practice, and a couple conferences, I finally sold my first book Chicks and Salsa. Neil: I absolutely wanted to be an illustrator my whole life! From when I drew monsters that played sports at age 3, to unflattering portraits of my teachers in middle school, to my first children’s book submission to a publisher when I was 22. The only times when I doubted I would be an illustrator was when I though I might become an animator. Lo and behold, I can be both now! Aaron: Well, there is more Joey on the way. Even now, Neil is illustrating the second book. I also have a new picture book in the works called Evil Carrots about a bunny that thinks he’s being stalked by sinister root vegetables. Neil: Yep, I’m currently in the middle of working on Joey Fly 2! And it is, hands down, the most fun I’ve ever had being an artist. The script is solid gold! Abby: Good to know that there is more Joey Fly in our future! And finally, this is a question I always love to ask authors and illustrators: what are some of your favorite children's books? In particular, what are some graphic novels that you like? Abby: Guys, thanks so much for stopping by my blog today! And readers, if you have questions or comments for Aaron or Neil, leave 'em in the comments because they'll be checking in!